Soon to be a recurring team at their United Filmmakers Organization, Alan & Eric Between Hello And Goodbye sees their flagship director Peter Chan making his feature debut with this Lee Chi-Ngai co-penned triangle drama of love and friendship that should've starred THREE Eric Tsang's to fully work. Noble, intelligent but mostly only when focusing on Eric Tsang's award winning performance, you'll live through Peter Chan's good instincts but not lack of skill to affect across his trio of subjects. Lee Chi-Ngai and Barry Wong write sufficiently enough, talking about storybook dreams for the Alan and Eric characters as children, with the former being Sinbad and the latter lacking any selfish aura to complain about his pirate role. Hinting at the real life treasure island for these two being San Francisco (where the film was partly shot), it's a key aura to the film that has as much to do with childish dreams as with forming the status of adulthood/human being. Director Chan has on hand cinematographer Jingle Ma to make matters natural looking but equally dreamy (a Jingle Ma specialty) and quickly breezes through his narrative structure. This means a very much acceptable, short dip into the child personas of Alan and Eric but a way too quick transition through the adult stories as well. There's reunion, a chicken farm created 5 minutes later, Alan turning into a mega popstar and Maggie Cheung's Olive cheerily being introduced as an integral part of the their lives. And that probably is a key for me as to why the film stumbles; an all too exaggerated cheery nature to Alan Tam and Maggie Cheung's performances. Although Maggie has a sitdown with Eric to explain her stance on her outward nature, it's part of a weak side to Alan & Eric Between Hello And Goodbye that is added onto by the general weak acting (as should be expected) by Alan Tam who doesn't look comfortable doing much of anything. It's a testament to co-producer Eric Tsang that he manages to gel with the weaknesses around him because here is a stellar human being of a character that is captured exceptionally well by the chubby, little guy. Very much making sense that this happy-go lucky fella has feelings inside his shell that makes him a sensitive person, it's suggested that Eric has never fallen in love until meeting Olive and while the rejection hurts, he does love to be there for her as a friend. Tsang restrains himself (even audible in his own dubbing!) and keeps dramatic intentions by Peter Chan well afloat. It can be argued that the mentioned exaggerations is consciously part of a structure but it's a risky venture by Peter Chan that sinks two thirds of Alan & Eric Between Hello And Goodbye. 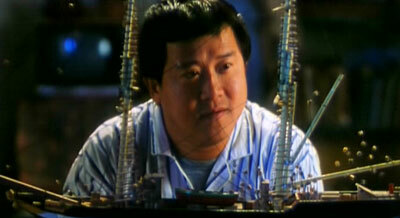 There are wonderful scenes imbedded here and it's pretty much any scene Eric Tsang is involved in. Be it communicating by himself, in a subtle, totally heartfelt way together with Maggie Cheung's alcoholic self during a pivotal Christmas Eve-scene or during the final reel that puts an end to themes established about the journey between hello and goodbye. Even during these scenes, Tsang has his character doubt his status as a complete human being and it's where he reaches our hearts because we, along with Alan and Olive can safely say that there probably is none as complete as Eric. And for a moment we forget that Peter Chan rides a dramatic wave of success only through his little guy. It's not enough but a reference movie for Eric Tsang. He grew up. Universe presents the film in an aspect ratio of 1.83:1 approximately. The print is quite clean and possesses natural colours. Sharpness is fair and the presentation overall above average coming from Universe. The Cantonese/English Dolby Digital 5.1 remix I'm only running through a 2.0 setup but it seems to very much adhere to the mono roots of the movie. Some cracks on the soundtrack on a few occasions represents the only detraction. A Mandarin/English Dolby Digital 2.0 option is also included. The English subtitles mostly stumble when they miss a word or two but otherwise the translation is well-worded. Traditional and Chinese subtitles are also available. Extras are limited to trailers for Alan & Eric Between Hello And Goodbye, The Beloved Son Of God, Papa, Can You Hear Me Sing and The Lunatics.